Spectaculaire Japanse stijl huis op een hectare met een zwembad. De andere hectare is met de hand geklaard door onze tuinlieden om de natuurlijke stroom van de lava te behouden. Inheemse planten en fruit zijn geplant langs de lavarots. Hoor de golven breken op de lava rotsen op slechts een paar blokken van het huis. Deze woning one-of-a-kind is voorzien van twee master suites. Elke suite heeft ongeveer 600 vierkante voet en is voorzien van slaap- en zitgedeeltes met een smart-tv en een videorecorder / dvd. De belangrijkste woongedeelte is voorzien van de volledig uitgeruste keuken, formele eetkamer, een informeel diner, formele woonkamer en een grote hoofdingang. Alle kamers zijn smaakvol ingericht met Japanse kunst. Binnen in de woning is een eigen tuin met tropische planten en bloemen, die accent de kleine waterval, beek en een visvijver. We beschikken over een eigen zwembad met een groot dek plus overdekte Lanai voor BBQ en ontspannen. Het huis is 3000 vierkante voet en is op een volledig aangelegd hectare. We onderhouden het terrein van een hectare aan de overkant van de straat van ons huis. Onze tuinarchitecten hebben de hand gewist de partij de natuurlijke stroom van de lava te behouden. Onze gasten zijn van harte welkom om het een hectare groot stuk te verkennen en de inheemse planten te bekijken die we hebben geplant. Visvijver, volledig aangelegd hectare met kokospalmen, seizoengebonden ster fruit, mango's, breadfruit, cashewnoten, ananas, evenals citrusbomen. Twee fietsen en helmen voor uw gebruik; Sommige vissen en snorkeluitrusting zijn in de breezeway. Very fine accommodations! Decor was fantastic. Very comfortable beds. Japanese style home rocks. More towels please. Too many keys. Well stocked kitchen. Stimulating reading material. Great traditional style home. Very welcoming. We LOVED this place. So beautiful and relaxing. We especially loved the outdoor section of the house. We will stay here again. Thank you! Super unique and interesting home. Gorgeous grounds a must see. Wonderful! The home was a bit daunting at first, with so many separate areas to explore. There are a ton of locks and screened windows to open at the beginning to take advantage of the cooling breezes. A plethora of fans (ceiling and standalone) were strategically placed for best air circulation. Regardless, the kitchen area remained quite hot and it was a pleasure to move into the lanai for meals once prepared. By the second day we were settled in and loving the unique features of the home and property. Truly beautiful in design and functionality. The two master suites were spectacular, both huge and airy. The main master suite had two massive walk in closets and the en-suite was unique with a Japanese style shower (and bath). So hard to describe - you have to see it! The second master suite had an en-suite with two separate toilets and sinks, and a jetted tub and separate shower between the facilities. Both suites had a large sitting area in the bedroom. The kitchen, formal dining room and living room with a huge attached lanai and third full bathroom was amazing. We didn’t use the formal living and dining rooms, preferring the “lanai room” but they were beautiful. The final separate room was the fireplace room (also could be a bedroom) which had these gorgeous skylights and was super comfortable. The most beautiful portion of the home was the interior courtyard with the koi pond and vegetation. The grounds were enormous and shockingly beautiful. The only detractor I might mention was the condition of the swimming pool decking and lounge chairs. I would suggest that these need to be replaced as some decking boards are lifting with screws protruding, and the lounge chairs are unusable. The first night we were there a deluge of rain swept leaves and debris into the pool. Rachel Willis was very responsive once notified by sending out the pool company right away to resolve this issue. A walk through the adjacent lot across the road was worth it as it was a fascinating display of beautiful foliage and plants, growing through the lava rock. So amazing! Finally, Rachel Willis was really quick to to respond to questions or concerns via text. She was such a pleasure to correspond with. Overall, I would highly recommend this lovely home and property. This beautiful home is definitely unique, but when you realize that you have a home away from the cares of the world, it feels like heaven. We loved everything about it, even the neighborly chicken that hung around to greet us. 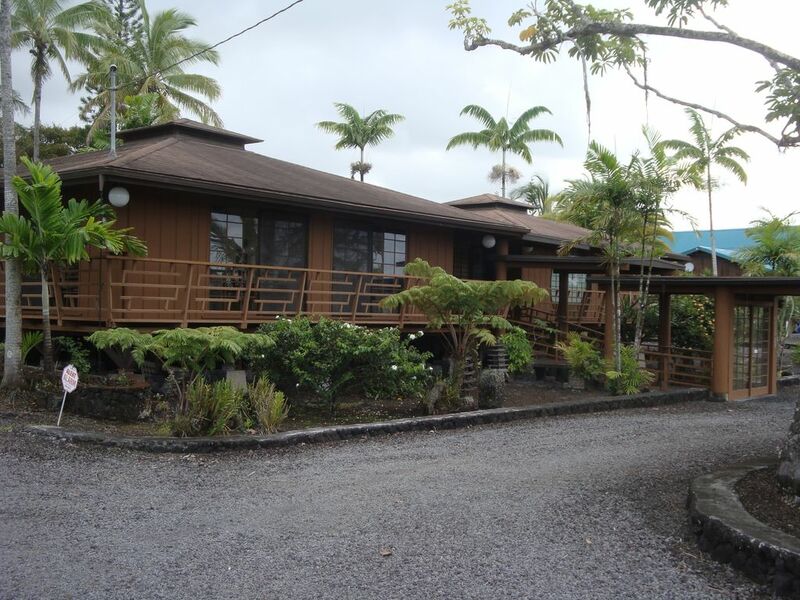 The Hawaiian views close to the home are beautiful and we enjoyed the neighbors and the nature. We would love to come back again one day. Ons huis ligt dicht bij de Stille Oceaan, watervallen, lavastromen, warm water zwembad verwarmd door de vulkaan, en de beste restaurants. Sommige van de hierboven gecontroleerde activiteiten zijn beschikbaar op de Hilo kant van de Big Island.